Search again Found 949 results for your search. Showing page 1 of 48. Chinese sailors visit near Darwin (NT), evidence of 15th Century Ming statuette found. Dutch documents record the journeys of Macassan trepangers (Indigenous traders from Indonesia) to ‘Marege’, as the Macassans call Australia. Until approx. 1700: Indonesian trepang (sea slugs, sea cucumber) fishers visit northern Australia. Macassan praus sail to the north eastern coast of the Northern Territory. Trade between Aboriginal people and the Macassans continues until it is stopped by the South Australian government in 1906. Bone tool deposits at Otway Peninsula, Victoria suggest Aboriginal people were working with animal skins. Dutchman Willem Jansz and the people on his ship Duyfken explore the western coast of Cape York Peninsula, the first Europeans to have contact with Australian Aboriginal people. The two groups clashed. Replica of the Duyfken. The name Duyfken comes from the Dutch word for ‘little dove’ or ‘little pigeon’ and was a popular name for small fast ships. 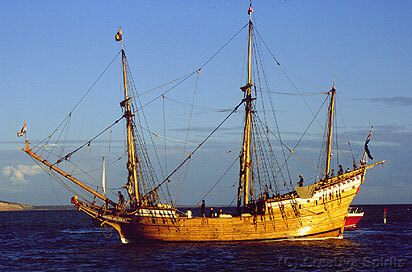 The Spaniard Luis Vaez De Torres sailed through Torres Strait. The oldest dated rock painting is believed to come from the 1620s. The rock painting depicts a sailing boat and is proof of Aboriginal people’s early contact, possibly with Macassars from Indonesia fishing for trepang . Dutchman Jan Carstenz described several armed encounters with Aboriginal people on the northern coast of Australia. Shots were fired and an Aboriginal man was hit. Captain Phillip estimates an Aboriginal population of 1,500 people living in the Sydney Region. The total Aboriginal population is believed to be between 750,000 and 1 million . Captain Arthur Phillip raises the Union Jack at Sydney Cove to start a penal colony (and not a nation). Aboriginal resistance flares within a few days of arrival of the tall ships. The first conflict between the First Fleet arrivals and Aboriginal people takes place near Rushcutters Bay, Sydney. Two convicts are killed. Arabanoo is the first Aboriginal person captured by Europeans. A catastrophic smallpox epidemic decimates the Eora Aboriginal people of Port Jackson, Botany Bay and Broken Bay. Governor Phillip captures two Aboriginal men - Bennelong and Colebee. Colebee escapes but Bennelong is kept at Government House for five months. The Hawkesbury and Nepean Wars between Aboriginal people and white invaders start in NSW. Led by Pemulwuy and his son Tedbury, Aboriginal people raid stations or assault sheep and cattle because the growing number of colonists occupied more and more land. Many times they used firesticks to set the bush on fire, destroy buildings, and burn crops. The guerrillia-like wars continue until 1816. 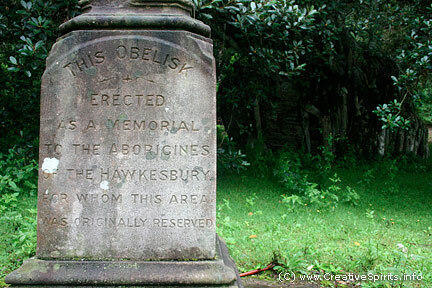 Aboriginal obelisk near the Hawkesbury River. It commemorates the Aboriginal people who occupied this area before they were wiped out by the white invaders. Pemulwuy spears Phillip’s gamekeeper, John McEntire, and Phillip orders the first punitive expedition. Orphan boy Bon-del is the first Aboriginal person to go to sea, sailing aboard the brig Supply, bound for Norfolk Island. Bennelong and a boy named Yemmerrawanie are taken to England by Phillip. They perform the first Aboriginal song to be heard in Europe. Bennelong meets George III. Yemmarrawanie dies in England. In 1795 Bennelong returns to Australia.